Interests - Jessie loves horses, in fact she is absolutely mad about horses. She also loves dogs especially huskies and samoyeds. Jessie loves drama, singing and dance and she visited Stagecoach drama school for 4 years. She also loves any kind of arts & crafts activities. Jessie also loves playing ukulele and recorder. Jessie was diagnosed with a childhood cancer ganglioneuroblastoma when she was 4 years old. She had 6 doses of chemotherapy and a 9 hour surgery to remove her 15cm tumour; however the surgeon at Great Ormond Street hospital only managed to remove 25% of the tumour. Unfortunately Jessica developed scoliosis following the surgery and started wearing Boston back brace given by the NHS. This Boston brace didn’t halt the scoliosis progression at all and that is why we decided to go abroad where they made a Cheneau brace for Jessie. I cannot praise the Cheneau brace and the guys who made it in the Czech Republic more – the brace didn’t improve the scoliosis but held it more or less stable for a good 2 1/2 years. We were hoping to postpone her spinal growth rods surgery for as long as possible and it looked like we could postpone it until Jessie is 11 years old – then they could only do spinal fusion! Unfortunately, about 4 weeks ago, Jessie started limping, tripping over and losing a sensation in her right thigh – she had her routine MRI scan brought forward and we found out that her tumour is bigger than it was before. It grew slowly for years and it started pressing onto her spinal cord causing her all these symptoms – symptoms of spinal cord compression! The tumour started growing not because it’s malignant but actually because it is benign and is maturing into a fully benign tumour which is great news but not so great when it’s pressing onto a spinal cord. We were so happy with her stable scoliosis and in the end it’s the growing tumour that is bringing this operation forward. So, Jessie is having a SURGERY and I mean a major surgery – she is actually having two surgeries in one and it will most likely happen on the 14th of February. These two surgeries in one will involve taking her 15cm long tumour out of her spinal canal plus inserting spinal growth rods to straighten the spine. But to make the matter just a little more complicated, she contracted the so dangerous if it’s gets into an open wound, MRSA infection, so we must do our best for her to get rid of it before the surgery. We haven’t got much time, but given the emergency of this surgery, I think they will decide to go ahead even if we don’t get rid of it as, if they delay the surgery, Jessie could be paralysed – she takes steroids to reduce the pressure onto her spinal cord at the moment. We have an appointment with Jessie’s oncologist, neurosurgeon and orthopaedic surgeon on Tuesday to discuss the surgery and the risks and outcomes. I am sorry for not updating for such a long time. Life seems to be back to normal (for now) with Jessie recovering so amazingly well following her complicated surgery in February. In November, Jessie received a Bravery Award from the Stagecoach Theatre Arts for being brave, amazing and wonderful, during her tumour and scoliosis treatment. It was a special day for all of us. This day kind of sealed all of her treatment, hospital visits and ups and downs, and we celebrated this amazing achievement with an invitation to see Shrek the Musical at the Drury Lane Theater in London. Jessie really loved it and so did I.
Jessie also achieved amazing results at school considering she missed 3 months of school in year 4. She is in year 5 now and her lovely teacher told me at our last parents and teacher evening that she is better than expected in Maths and English and way in advance in Reading. I was so pleased to hear this. She worked so hard on catching up on the school work and she did it. All of Jessie’s scans and x-rays confirmed that she’s healing very well and so far there hasn’t been any progression in her scoliosis curve. She is walking very well now and enjoying life to the full. Her next MRI scan is booked for March and x-ray for April. If her curve gets bigger by then, Mr Tucker will plan an extension surgery of her rigid rods by converting her rods into a sliding domino. This might be done in the summer so hopefully if all goes well and fingers crossed, we should have a pretty uneventful 7 months. I really hope this will be the case. So, until then, Jessie will move to the “moved on” category on Post Pals and return back should she have her surgery in the summer. I would love to say a heartfelt thank you to all of you wonderful people who sent Jessie cards, letters, stickers, pressies etc. Also a huge praise goes to all the girls at Post Pals for doing such a wonderful job. You have all definitely put a smile on her face and more than a one! Happy New Year to you, good health, love and happiness! Jessie had a great month as she seems fully recovered from her surgery in February. The only problem she has at the moment is that some of the nerves were cut during the surgery to take her tumour out and these nerves are not sending signals to her tummy muscles to contract, so half of her tummy is not contracting when pulled in. I have spoken to Jessie’s oncologist and she told me that there is not much that can be done with this at the moment. Apart from this, Jessie is enjoying her “back brace free” life to the full with lots of activities and we also attended a fantastic Post Pals party where we met some of the sweet Pals and also the amazing girls dedicated to running Post Pals. We had a lovely day full of fun and sure we have plenty of great memories to remember this day. Jessie also received her end of school year 4 report and I was glad to read that missing 3 months of school didn’t stop her from achieving better than expected English Literacy and Writing grades and as expected Maths grades. I am so proud of her, I really am. As some of you might know, I am teaching Jessie Czech language at home so she can confidently speak to her grandparents in the Czech Republic and she is doing Year 3 exam on the 1st of September – she simply learns the same curriculum that Czech children are, visits Czech school when we are abroad, and does the same tests that her fellow pupils do. She’s been putting a lot of effort into this and I can proudly say that she is fluent in Czech speaking/grammar/writing. Her Czech teachers are very impressed. Life simply feels normal for the first time in 5 years since Jessie’s cancer and scoliosis cancer in December 2005 and March 2006 – I want this feeling to last forever!!! Please pray for Jessie to continue to thrive. Jessie was overwhelmed with the number of cards, letters and presents from you guys – last months was simply amazing and Jessie loved each and every letter she received from Holland, Italy, UK, Brazil, US, Sweden etc. You guys simply rock – thank you ever so much! After 4 years of wearing her back brace, Jessie was told today to put it in a bin by her orthopaedic surgeon. She actually cried tears of joy and we are all very happy for her. This is obviously a very big deal for her as she is a 9 1/2 year old girl developing her own style, sense of her body, figure, and having to wear a back brace was getting increasingly upsetting. It was all good news at our last orthopaedics appointment 3 weeks ago too. The surgeon were really pleased with his surgical skills done on the 14th of February when Jessie had her tumour taken out and her spinal rods inserted to slightly correct her scoliosis, as well as with Jessie’s better than expected recovery. Although, I am aware than any rigid plan cannot be made for Jessie’s future, as one never knows how much she will grow in the next few years and how her spine will behave, but they told us that in the case of her growing a lot in the next few years, they will simply just cut her existing rods and inserts “sliding domino” piece and that way her solid rods will be able to extend. Apparently, this can all be done in 1 hour surgery. Excellent news!! The other good news I didn’t expect to hear today is that apparently she might not even need the big and risky surgery called spinal fusion, where all of her curved vertebras would be fused into one solid spine, as apparently the nature of her February surgery might help her spine to fuse spontaneously without any surgical intervention. These of course are IDEAL SCENARIOS one would hope for, but for now we just need to wait and see what happens in the future. Our oncology appointment was positive as well and her tumour appears to be stable. The only slight issue at the moment is that some of the nerves were cut during the surgery so only muscles on right half of her tummy are working and the left part is weak and not responding. Jessie’s oncologist is trying to find out if there is anything that can be done to resolve this problem. THANK YOU EVER SO MUCH for your post, presents, cards, stories – Jessie reads each and every one of them with an excitement and interest. Your kind post is so much appreciated!!!! Unfortunately, in the first week of January, Jessie started limping, tripping over, having problems walking down the stairs and losing a sensation in her right thigh. I took her to the hospital 4 times and the doctors all seemed to say that she is fine however her oncologist brought her routine MRI scan forward and we found out that her tumour is bigger than it was 4 years ago. It grew slowly for years and it started pressing onto her spinal cord causing her all these symptoms – symptoms of spinal cord compression! The tumour started growing not because it’s malignant but actually because it is benign and is maturing into a fully benign tumour which is great news but not so great when it’s pressing onto a spinal cord. We were so happy with her stable scoliosis and in the end it was the growing tumour that brought Jessie’s operation forward and made it a matter of urgency. So, Jessie had a SURGERY and I mean a major surgery on February the 14th. The surgery took 9 long hours and her lovely neurosurgeon removed most of the tumour inside of her spinal canal to relieve the pressure it created. Then Jessie’s orthopaedic surgeon inserted spinal rods along her spine and slightly straightened her scoliosis – my guess is that her scoliotic curve reduced from 65 degrees to 40 degrees which is a good degree of correction especially when they only planned to take the tumour out and stabilise rather than straighten her spine. The doctors told us that the risk of paralysis from these two difficult surgeries could be between 30 and 40% but Jessie is moving her legs so we are absolutely thrilled. Today is day 20 post surgery and we are happy to say that Jessie is WALKING and most importantly she is NOT tripping over, limping etc. It looks like the surgery was a success. She also stopped her high dose of steroids to relieve any pressure onto her spinal cord on Friday so she is still very chubby in her face but this swelling due to water retention should go down in about 8 weeks. Jessie is not allowed to go to school for further 3 or 4 weeks so I am doing home education with her. One of our main concerns at the moment is whether Jessie will be able to grow properly due to her fixed non extendable rods along her spine. She has 12 free moving vertebras through which she can grow but the rest is fixed and this will restrict her growth. Jessie will need a proper physiotherapy to get her walking and moving properly again after such a big surgery so we are fundraising for her to be able to go to the Czech Republic for an intensive 6 week inpatient rehabilitation treatment for children with neurological problems, scoliosis and post-surgical issues. I would like to express our heartfelt thanks to all of you who sent Jessie post/presents to cheer her up during such difficult time for her and as she recovers from her big operation. I am sorry but I cannot individually thank you by naming you here as simply there were so many of you but we are overwhelmed by the lovely and caring post from all of you. Jessie was also pleased to get post from the UK as well as from Holland, Sweden, Finland and the Czech Republic (she can also read and speak Czech). Thank you again. Jessie has not been well with tonsillitis and a cold for two weeks now but she is getting better day by day. We went to Holland for Easter and we had a really nice and mainly relaxing time as the weather was pretty bad there. After getting together with Bobby’s fund, we started a fundraising campaign in order to raise money for Jessica to receive further treatment in America, as her tumor still remains very large. Big thanks for the wonderful post this month go to: Maria Carney, Helen Fulcher, Judith Shiel, Vickie Miller, Kate Dee, Maria, Alberto, Berenice, Callum&Emma, Julie, Chloe G and Jenn. Jessie had her half-term holiday last week so we decided to visit my sister and her three children in Germany. We all had a fantastic time there and Jessie loved playing with her cousins, going swimming, visiting a castle and a horse centre. Jessie was sad to leave her great and cheeky cousins. Jessie is back at school having a pyjama party today in aim of RSPCA and I am busy with getting all the information needed for second opinions in regards to Jessica’s tumor that remains wrapped around her spine. I hope we get some clear opinions soon. After spending three great days in Devon where we were invited by Bobby’s family (Bobby was diagnosed with neuroblastoma stage 4 cancer 2 1/2 years ago and is a picture of health now) and getting advice about complete natural holistic healthy lifestyle which Bobby follows, we decided to follow Bobby’s routine and we were kindly supported by Bobby’s fund to make it all possible. We purify our own water, juice fresh juices, clean our air at home and most of all, Jessica eats fully organic, freshly prepared meals, plenty of fruit and vegetables. We always ate very healthily in our house but this time we are taking it even more seriously. Jessie knows that she is not allowed sweets, chocolates, junk food and she knows why it’s not good for her. We are also seeing a private complimentary medicine doctor once a month and he checks Jessie’s blood, urine and prescribes her vitamins and food supplements regime to improve her immune system and possibly to improve her chances of fighting against cancer. 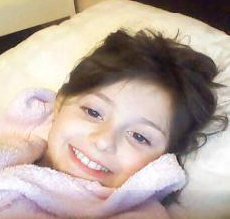 Jessica’s next MRI scan is on Wednesday the 2nd of April. Two months earlier than normal because of the little scare we had in January. Jessie continues to be happy, full of energy, loving and sweet as ever and I love her for being so positive, kind and caring despite everything that happened to her in the past. The Post Pals Team, Jenn 2 for the cute Valentine’s card and very sunny sunflower card, Erin F’s nanny and grandad for a lovely sparkly card, Julie and Monty the doggy for a great hand made card, Nicky for the great jokes, Karolina from Finland with the same Birthday as Jessie but 12 year old ;-), secret Valentine’s sender Helen F for the wonderful hand made cards for Jessie to use or keep, Becky for the sweet hand made card with a beautiful picture of a white horse which Jessie loves so much, Kate Dee for a letter outlining her London trip to GOSH which we are so familiar with and of course to Colette for letter, card and that gorgeous bracelet, glamour make-up bag, cards and notes. THANK YOU SO MUCH!! We had a wonderful Christmas time in the Czech Republic and a week of skiing in Slovakia. We both loved the sun and snow in the mountains and Jessie learned to ski and use the lift in 2 hours with help from a ski instructor. We miss the snow! SCOLIOSIS: Jessie has got a new bigger brace and she is adjusting very well to it. TONSILLITIS: Jessie had another episode of tonsillitis (6 or 7 in total in 1 year) so I decided to go ahead with the tonsillectomy on April 7th. She will need to be off school for 2 weeks but they have spring holidays at school anyway so she will not miss out on school. CANCER: We went to see Jessie’s consultant at GOSH last Thursday and she told me that according to the radiologist’s report, Jessie’s tumor is growing and pressing on her spinal cord despite her completely satisfactory neurological examination that day and urine catecholamine’s (tumor markers) lower than the last time. I was shocked, scared and worried but I hoped that she’d made a mistake because Jessie is looking like a picture of health at the moment. I asked her to review it again with the MRI radiologist in the afternoon and to call me back. She called me back 4 hours later after they had reviewed all 100 MRI scan pictures and they think they raised the alarm unnecessarily and Jessie is fine and she will not require all she told me 4 hours earlier (CT scan, MIBG scan, bone marrow aspirates, sonograph, steroid injections, radiotherapy)!! Now, what do you think? On one hand, I was so happy to hear that, but on the other, I am furious and I am now in the process of getting copies of all of Jessie’s medical files and MRI scans. I am going to send them all around the world for second opinions with the help of Kevin (dad to Bobby diagnosed with neuroblastoma stage 4) and his fund www.bobbysfund.org. I can’t let the doctors make another mistake like this. What if they were correct the first time? What if?? BIG THANKS this month to Kate Dee, Ellyn Yeager, Despina, Julie & Alan & Sue & Peter Barret, Post Pals team, Louis Woodcork and everyone else for the lovely post and presents for Jessica. Jessie had a chest infection and high fever last week. She finished her 5 day course of antibiotics today and hasn’t got a fever anymore. We are flying to the Czech Republic tomorrow and she will be seen by her lovely paediatrician there on Wednesday for a check up. I think she might need more antibiotics as her cough hasn’t cleared yet. Jessie is very excited about going to Czech for Christmas and she has been talking about skiing for ages. She just can’t wait. I hope she will be able to do it when she gets better after the chest infection but she knows that she has to take it easy. I had tickets to Jack and the Beanstalk pantomime and a time slot to see Father Christmas at Harrods last weekend but I just couldn’t take her! I really looked forward to treating her to those two special treats but she really needed to sleep and just rest properly for 5 days. She didn’t feel like doing anything but watching her DVDs. I gave the tickets to pantomime and Harrods to two of Jessie’s friends. Our appointment with the orthopaedics went well and Jessie’s scoliosis is stable. We are very happy that the brace seems to be doing the job. I would like to wish you all a Merry Christmas and Happy New Year 2008. May the New Year bring only joy and happiness into your lives. Also big thanks to those that sent Jessie post in November. Every time she gets her post, she says how all those people are so kind and how lucky she is to get such lovely post. CANCER: Jessica had her MRI scan in October and her tumor is stable. Her catecholamines urine tests that determine the tumor’s activity came back good. HVA is better and VMA is slightly raised but I don’t think that’s something to worry about. TONSILLITIS: Yesterday we had an appointment at the ear-nose-throat clinic at the Great Ormond Street Hospital and because Jessie had 6 nasty periods of tonsillitis this year already, they want to take them out next year whilst she is on her Easter holidays. I told them that I would wait and see how she does during the winter period and that I will let them know if I want her to go ahead with the operation. She would go under general anaesthetic and she would have to stay at the hospital overnight and two weeks at home. I am going to think twice about this operation because Jessie has been through enough already and I know that she will be in pain after this operation for a while. SCOLIOSIS: Jessie is getting used to her brace and I am so proud of her. On some occasions we take if off (parties, swimming etc.) but most of the time it’s on. We have an appointment to see the orthotics and the orthopaedics in December and I think they will be taking new measurements for a new brace as Jessie has grown a lot. Again, I would like to say a big thank you to all that sent some lovely post to Jessie, especially Nicole D, Julie Barrett, Kate Dee and the Post Pals team for the Halloween sparkles. Jessie loved it! Thank you guys so much. Jessie had a fantastic summer. We visited four countries – Slovakia, Czech Republic, Greece (Rhodes) and Mallorca. Before we left for Slovakia, Jessie had a nasty episode of viral tonsillitis and an even worst episode of tonsillitis and candida in her mouth along with 6 days of fever on our holiday in Mallorca. Despite the illness, she enjoyed pony riding, T-shirt painting, salt bottles making and a mini club on our holiday in Mallorca, but most of the time she spent sleeping in a hotel room. We were sent on this great holiday by the Starlight foundation and I would like to say big thank you for giving us the opportunity to visit this beautiful island. Our holiday in Rhodes was fantastic and Jessie loved swimming in the pool and the sea too. She learnt to swim there. Jessie saw her grandparents on our stop in the Czech Republic. She loved horse riding there and we bought her a new bike, so every morning she took her grandad for a long ride. We all had fun there. The weather was great and we enjoyed the summer to the full. This month we have some appointments lined up. Next week, Jessie should have another MRI scan to see how her tumor wrapper around her spine is doing, but she is still recovering after her nasty tonsillitis and candida, so I am not sure if she will be fit enough for general anaesthetics. The week after, we are seeing the spinal clinic at GOSH and after taking new x-rays of Jessie’s spine, we will see if her scoliosis has progressed or not. We also have an appointment at the orthotics department to review Jessie’s brace. Now the exciting news – Jessie will be 6 on the 18th September and she will have a joint birthday party with her fried Sade on Saturday 22nd September. They can’t wait! I would also like to say big thank you to all those still sending letters, presents and postcards to Jessie. She loves getting them. Last month we saw Jessica’s orthopaedic doctor at GOSH and were told that Jessica’s scoliosis progressed from 20 degrees to 40 degrees. She now has a congenital juvenile progressing scoliosis which is very difficult to treat. She started wearing Boston brace Jacket and she must wear it 23 hours a day in a month’s time. She needs to get used to it gradually but it’s not easy. The jacket is too tight and sometimes she finds herself short of breath. We are facing a tough summer with the brace and we can only hope it helps and Jessica avoids a spinal fusion surgery in the future. I am seeking a second opinion as to whether the Brace jacket is the best option at the moment. On a positive note, I have just received an e-mail from the Islington children’s physiotherapy service and after a long 9 month wait, Jessica has reached the top of their list and we can now call in to arrange a physiotherapy appointment for her weak stomach muscles, lordosis and scoliosis. Thank you to Chloe G (PostPals), Susanna and family, Laura H (PostPals), H and Bethan, Julie Barrett and Kate Dee. Big thanks also to PostPals for the Finding Nemo adventure game and to Jaime Matthews for the 2 artist’s canvases, brushes and pastel dye sticks. Jessica’s MRI scan results came back and are good. No change in the size of the tumour and the urine catecholamines improved. We are very happy with this news. Jessica continues to be relatively healthy with few colds and she loves going to school. Thanks to the Christian Lewis charity we were able to visit Disneyland at discounted room rates and we also received free VIP passes so we didn’t have to wait for any rides. Jessie really enjoyed Disneyland and she loved meeting Mickey and Minnie mouse. We also stayed 4 days in Paris and did a lot of sightseeing. It was a great and magical holiday. On 3rd of June I did the Race for life for Cancer research and at the moment we are collecting our sponsorship money. Jessie is awaiting her 6 monthly appointment with an orthopaedic surgeon at Great Ormond street on 8th June to check up her scoliosis. Thanks to Post Pals for your continued support. This month I took Jessie for a long holiday in the Czech Republic. We stayed there for 24 days and I took her to a children’s rehabilitation centre for her to learn some exercises for her weak stomach muscles. Jessie did lots of exercising and swimming, but she also received a massage, had a jacuzzi, did a hipotherapy and ergotherapy every day. She really enjoyed it but towards the end she fell ill with tonsillitis resulting in really high fevers for 4 days. Jessie is due her next MRI scan on Tuesday the 1st of May. We hope for good results. Thank you to everybody that sent Jessie lovely Easter cards. In February we received Jessica’s MRI scan results. Her tumor is still the same size so that’s good news for us. Jessica will continue with 3 monthly MRI scans to keep an eye on her tumor. Jessie had her pre-school boosters but no MMR this month and unfortunately the place where she had the shot got infected and we had to go to the hospital one night. Jessie received antibiotics and her arm is better now. Jessie still loves going to school and also her saturday school of performing arts. During the half-term holidays, I introduced Jessie to ice skating which she has fallen in love with and we also managed to go to the cinema, horse riding, swimming and lots more. Thank you to Alan and Julie Barratt, Kate Dee, Nicky, Aiyssa from the USA and others for sending some lovely cards and presents. It has been quite a while since I have up dated and I apologise for this. I took Jessie to the Czech Republic for Christmas to see her grandparents and we stayed there for 25 days. She had lots of fun including skiing in the Czech mountains. She spent 2 days in the ski school and absolutely loved it. Jessie was supposed to start school full time in January but fell ill with tonsillitis and required a 5 day course of antibiotics which resulted in the postponing of her pre-school boosters. She will receive them after her MRI scan due on tuesday the 30th of January. We all pray for good MRI scan results and for her tumor being stable. Jessie started school this week and she also attends Stage coach school of performing arts every saturday morning which she really enjoys. They have 30 minutes singing, 30 minutes dancing and a 30 minutes acting session. I would like to say a big thank you to everyone at post pals for sending Jessie all those wonderful Christmas cards and a cool Christmas parcel from post pal ELF Chloe G. She loved it!!! It’s official! Jessica’s scoliosis has definitely improved. We saw Jessica’s orthopaedic doctor in October and I asked him if he could measure up the spine pictures taken in April and in September to compare. We were told in April that Jessie’s scoliosis is 23 degrees and that she doesn’t need bracing. Well according to the doctor in October (and I saw him measuring it up) it wasn’t 23 but 32 degrees. Somebody made a serious mistake in April but luckily for Jessie her scoliosis has significantly improved from 32 degrees to 20 degrees measured in September. That’s great news! I am so happy! It’s now clear that Jessie’s scoliosis was caused by the surgery in March and sorted itself out on its own. Let’s pray for Jessie’s scoliosis to continue to improve so she doesn’t require any bracing or rods operated in the future! I have sent an official complaint to find out who made such a serious mistake and hopefully we can get some positive results soon. Jessie had her MRI scan in October and we learned that it hasn’t changed in size so it’s still about 10x5x4cm big wrapped around 8 of Jessica’s vertebrae’s. The next follow up appointment is planned for January. Jessica started school in November and she really likes it. She only goes in every afternoon until she receives all her pre-school boosters in January-February but that’s enough for her I think. We have been having lots of fun lately and if you would like to find out more, please go to Jessica’s website. Thank you post pals for the continuous support. Jessie loves it! You guys rock!!! We love you!!! Jessica spent a lovely four weeks in the Czech Republic with her grandparents and family. In the first week of our visit Jessica fell ill with Broncho-pneumonia and had to take antibiotics for 10 days. She had a really high temperature and obviously a very bad cough. She pulled through in no time and enjoyed the rest of her holidays. Jessica went horse riding a lot, played with her friends and enjoyed lots of visits and activities. She was sad to leave her grandparents but we had to return back to London for our follow up appointment with Jessie’s oncologist at Great Ormond Street Hospital. Whilst in Czech, I saw many doctors including neurologist, rehabilitation doctor, oncologist and pediatrician and learned more about Jessie’s tumor and scoliosis. I was pleasantly surprised by the kindness and care of all the doctors that have taken interest in Jessica’s condition whilst abroad. We are currently experiencing some problems with appointments at Great Ormond Street Hospital but I hope this will be solved in the near future. Jessica, my lovely darling, is full of energy, laughter and optimism despite the terrible illness she is fighting against. On Monday October 2nd Jessica has another MRI scan to see the current situation of the tumor wrapped around 8 of her vertebras. We all hope for the tumor to be of the same size (possibly smaller) as it was 3 months ago with no evidence of growth or more eroding of Jessica’s vertebras. Thank you to everyone at Post Pals for sending Jessie special birthday wishes! This month we were told that Jessie will have to live with her tumor inside her body forever. The tumor is wrapped around 8 of her vertebrae’s and is eroding 3 of them. Jessie has also developed scoliosis but doesn’t need any treatment for it at the moment. Jessie is enjoying summer fun and apart one visit at the hospital with a fever she is doing fine and we both are very excited about a visit to the Czech Republic to see Jessie’s grandparents in August-September. Thank you Post Pals for sending Jessie lovely post and thank you for having her on your website. Thank you also to Emily, Allan Barrett, Cherie+Itsy, Julie Barrett and Kate. Jessie spent a night in hospital due to a temperature; we think she has the flu. I wanted to say big thank you to Angel Jenny for the lovely magazine she sent to Jessie and also everybody who sends mail and presents to Jessie. Thank you also to Julie Barrett, Emily, Kate Dee, Alan, Caroline, Becky Butler, etc. Thank you! It really puts a smile on her face! Today was a busy day starting with an appointment with Jessica’s oncologist who is getting a second opinion from an independent Orthopaedic from Birmingham about whether or not Jessie needs a back brace. She also said that she will discuss Jessie’s possible removal of the tumour as she feels it would be wise to remove the tumour as it could get bigger again and even spread. If safe, Jessie will need two more operations possibly in the autumn. We were also told that Jessie’s tumour is the most complicated and biggest of all the Ganglioneuroblastoma tumours they dealt with but if they remove it she has a good chance of survival. Jessie just had her last dose of chemotherapy! We have returned from the hospital this afternoon. We took Jessie there on wednesday night as her temperature reached 38.9 degrees Celsius. Immediately they accessed her port which wasn’t very pleasant this time as Jessie had a really high temperature and was very tired. Unfortunately it took three people to hold her in order to access the port. They gave her IV antibiotics as normal and it feels like we are becoming regular visitors in our local hospital. All Jessie’s blood counts dropped rapidly too so she needed a three hour blood transfusion on friday. Soon after the transfusion she got her colour and energy back. How amazing! She left hospital happy and energetic and that’s how I love to see her! She needs to be take oral antibiotics for the next 5 days and she is due a blood test on tuesday morning to see if she is fit enough for the Cado chemotherapy. Doctors suggest the chemo should be postponed as they don’t think the blood count will get back to normal until tuesday. I think so too as it would be too much for her again. We left the port accessed so she doesn’t have to have it accessed again or finger prick done. It needs to be de-accessed on tuesday though as it can only stay in for 7 days. A lot has changed recently, not all good news but Jessica is still doing very well. She has developed a scoliosis as a result of the surgery and will have to wear brace and have rods put in at some point in her life. The doctors have also decided not to operate on the rest of the tumour as her spine would collapse completely, so she will have to live with the tumour inside her. I hope this is not the doctor’s last and final decision as that would be very worrying for us. I wanted to thank you for having Jessica on Post Pals as she has been getting some post already and she really loves it. It definitely puts a smile on her face.